In wartime economy during World War second, the act for industrial adjustment had been promulgated by the government, then lots of companies were consolidated and reorganized. Thereby most of small and medium-sized companies which mainly run a business industry having no direct relation to war were abolished or merged by compulsion, and excess personnel occurred by this disposal was allotted for conscription. Since sake brewing industry was also no exception, “The outline of sake industrial adjustment” was promulgated along with this national policy. In addition, since it was difficult situation to purvey brown rice for sake, in 1944 Akita shurui seizoh Co., Ltd. was established in consideration of the following basic visions; establishment of quality production by skill exchange, establishment of quantitative production by taking regional consumption demands into consideration, management’s rationalization, and avoidance of distribution delay of brown rice. 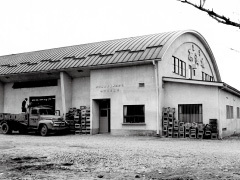 In 1950, the main brewery started its sake production in a place famous as a source of the purest water. Even after that, we built a new brewing institution, bottling factory and low temperature storage warehouse to improve our production capacity. In 1990, a rice polishing plant was built in Goshono (one of the districts in Akita-city) and then new Goshono brewery was built in 1998, where we practice sake brewing using techniques by young employees with the latest temperature management devices, succeeding to surpass traditional brewing methods by hand. In 2005, a part pf our brewery was rebuilt as “sake-dojo Senningura” (Sennin is one of the hermits who discipline their mind hard, and dojo means a training hall). We now make good use of this brewery to create “new traditions” which will be succeeded into the future, and to continue pursuing the development of traditional sake brewing skills. In this way, we promote our sake brewing methods for future generations, while respecting traditions. We have been awarded a gold medal at the Annual Japan New Sake Awards for 15 consecutive years (as of 2014) as a company. This is the 2nd highest records total ever. As a brewery, Goshono brewery has been received the gold medal for 11 consecutive years. This is the top tie record for the most receives as a brewery. We have also been awarded a gold medal at the Tohoku District Sake Competition for 19 consecutive years. During these 19 years, we won Soudai (the top award) 5 times. We are proud of this award records and continue to brew fine sake “Takashimizu”. ※What is the Annual Japan New Sake Awards? According to National Research Institute of Brewing, the Annual Japan New Sake Awards has been held under the joint auspices of the National Research Institute of Brewing (NRIB) and the Japan Sake and Shochu makers Association. This competition started in 1911 and this is the 102nd year. This is the only nationwide sake competition in Japan. Every year, newly sake from all over Japan is evaluated. 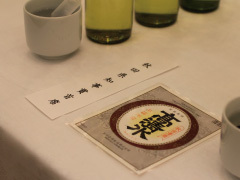 Akita Shurui Seizoh Co., Ltd. was established after the merging of 12 small breweries. However, it is easy to imagine that uniting different breweries which run sake brewing industry severally as their family business was not easy at all. In order to strengthen their bounds and overcome any economic situation changing rapidly after WWII, new brand name was sought from the public. Then “Takashimizu” was selected among 5,037 submissions by intellectuals of Akita (superintendent of Akita tax office, curator of prefectual library, the president of Akita Chamber of Commerce and Industry, and the president of the Akita-sakigake newspaper office). “Takashimizu” literally means “High spring water”. In Akita city, there is an area named “Hillock of Takashimizu”, where is famous for the source of water and still has a lot of spring water. 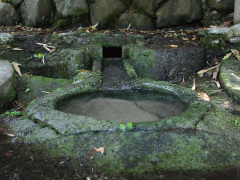 It is said that sacred spring “Takashimizu” was suddenly gushed in middle of the 7th century in this area and it is still gently gushed out calmly today. In addition, this area is also known as the places where Akita castle, representing their power as one of the biggest citadels in the extreme north of Japan, once stood and the cradle of Akita culture. Our brand name “Takashimizu” comes from this “Hillock of Takashimizu”. Kawashiri-area in Akita-city where our main brewery stands is also known as the area which is blessed with good quality water, and it is said that those water vein were same as the well that feudal lord Satake (Daimyo in Akita) used. Akita’s history cannot be talked without “Hillock of Takashimizu” where is blessed with pure water. Takashimizu also always brews fine sake with pure water and creates new history with our hometown “Akita”.